The London Fog: Do you want relish with the super sized Denialism Combo? Do you want relish with the super sized Denialism Combo? Yum! Here's one drive through I would love to idle in. I bet even the most inveterate vegetarian denialists among us might, just for a moment, be tempted to take up the practice of eating beef! 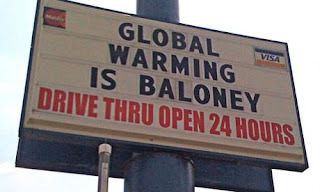 Me: But "Global Warming is Baloney" is certainly a different sort of message, a more political viewpoint? McNelis: I would agree that it's a viewpoint, but not necessarily a political one. But we're not sheeple around here, and while Barack Obama would like to have you believe that no one is entitled to have a view other than his, if someone wants to stand up and say "Global Warming is Baloney", then I'm all for it. It doesn't matter to me, whether I believe in it or not. They have first amendment rights to say whatever's on their mind. And nobody dictates otherwise.